In an alternate timeline, Alex Kidd could have remained Sega’s mascot, instead of being unceremoniously dumped by Sega in favour of the much cooler Sonic the Hedgehog and forced into early retirement (a retirement that’s now lasted nearly three decades). Just think: if things had been different and Sonic had never been created, we could instead have enjoyed a whole bunch of Alex Kidd games on the Mega Drive, been treated to Alex Kidd Adventure on the Dreamcast, tolerated a bunch of ropey 3D Alex Kidd platformers and could now be morbidly curious about an upcoming Alex Kidd live-action movie. Actually, in hindsight, that’s probably for the best. 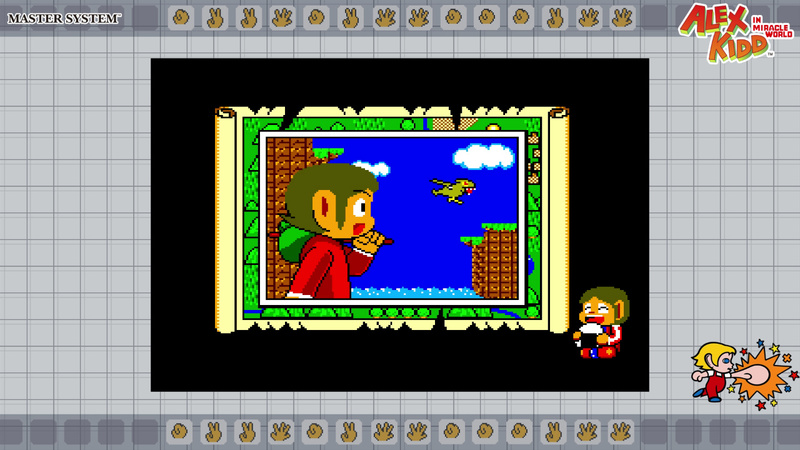 One of the reasons Alex Kidd was probably ditched in favour of a cooler, bluer alternative was that the quality of his games decreased with each entry: fans of the Liam Gallagher lookalike generally agree that the first in the series, Alex Kidd In Miracle World, was the best of the bunch. It’s this high point in the series that Sega and the emulation masters at M2 have decided to grant the Sega Ages treatment, meaning what we have here is – like the other Sega Ages titles – the most definitive version of the game by a country mile. For those too young to remember it (or too American; the Master System was huge in Europe and Brazil but was destroyed by the NES in North America), Alex Kidd’s debut adventure has the big-eared lad heading out to defeat the evil Janken the Great, rescue the prince and princess of the city of Radaxian and bring peace to the land. But don’t worry about that; nobody remembers the story. What everyone who played it does remember is how difficult it is. Alex Kidd In Miracle World is unrepentant in its trickiness; part of this is down to the game’s slightly loose controls which, even back in the ‘80s, never felt quite as tight as those of the moustachioed brothers across the shopping aisle. The other part, though, is clearly deliberate: enemies are placed in awkward locations designed to annoy you, and some apparent power-ups instead trigger the appearance of Death, who mercilessly pursues you until he catches and kills you. Add to that the numerous Janken (Rock, Paper, Scissors) games you’ll encounter along the way – adding a seemingly random element to whether you’ll lose lives for the sake of it – and it’s fair to say that Miracle World doesn’t so much hold the player’s hand as thrust it into a tiger cage. Thankfully for some, the Sega Ages version of the game on Switch introduces a short rewind function, which allows you to undo any errors and pretend they never happened. It only goes back five seconds, though, meaning you’ll need to trigger it almost immediately after your mistake or it may be too late to do anything about it. This rewind function is one of many little tweaks and additions M2 has bestowed upon Miracle World. Most of these are found in the new 'Ages' version of the game (there’s still the option to play the untouched classic version, for grumpy old purists who don’t like change). The most notable new feature in the Ages version is a reworked soundtrack that makes use of the Master System’s FM sound unit: this was an add-on that was released exclusively in Japan, and greatly improved the quality of the music in some games. The interesting twist here is that Alex Kidd In Miracle World didn’t actually have FM support back in the day – the FM unit was released later – so the FM soundtrack you get in the Sega Ages version is a brand new one, designed to give fans an idea of how one would have sounded back then. Also new to Ages mode are lovely little illustrations that appear between stages, and – more importantly – the ability to continue as often as you like without jumping through hoops. The original game had a little-known Continue feature, where players who died with at least $400 collected could hold Up on the D-Pad, press the second button eight times and sacrifice a goat to trigger the secret ‘Continue’ option. Well, everything except the goat bit. This time, though, you can continue over and over, regardless of whether you’ve collected enough gold. Attention to detail just permeates every nook and cranny of this re-release, as is the Sega Ages way. In the options screen, you can choose between three versions of the game: the Japanese release (complete with Sega Mark III intro logo), the western re-release and even the ‘Hamburger’ version. Long story short, when Alex Kidd was built into the Master System II consoles, the game was tweaked slightly: the jump and punch buttons were swapped over to the more widely-accepted standard, and in between each stage Alex was seen eating a hamburger instead of a rice ball. It's the little things. In an even better touch, the game’s default border contains a little secret of its own: along the top of the screen, you’ll see a series of icons from the Rock, Paper, Scissors mini-games. These aren’t just dumped on there for the hell of it: they’re actually the solutions to each of the Janken battles in the game (the bosses don’t actually select a random option, you see). This means you no longer have to memorise a sequence of 14 Janken solutions; you can just refer to your handy border and get on with your life. All this combines to make the ultimate version of an important retro game, one that many gamers – especially those in Europe and Brazil – may associate more with their childhoods than the Mario series. Modern players discovering it for the first time may take a while to get used to its slippery controls, which don’t really hold up well these days (hell, they didn’t really hold up back then). Overcome this clunkiness, though, and you’ll happy to see that Alex Kidd’s debut outing remains as charming as it was back when he was still the main man, and sneaker-wearing hedgehogs didn’t exist. 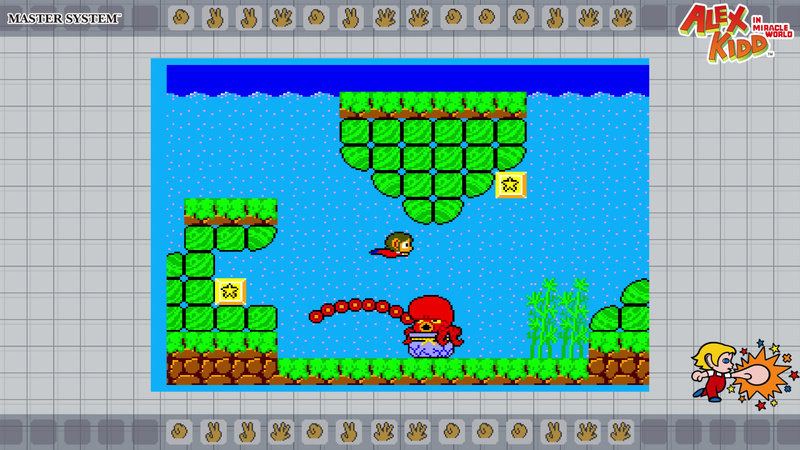 Alex Kidd’s floaty, slippery platforming may not be for everyone, especially those who didn’t get to grips with it the first time around. Long-time fans and newer gamers willing to see past its niggles, though, will be treated to the definitive version of an iconic Sega game, one whose new additions are both genuinely useful (adding a Janken walkthrough to the border is genius) and transformative (you may have played the game hundreds of times, but you’ve never played it with FM sound). A must-have for fans, but merely recommended for newcomers. Looking to pick it up next pay day...can't wait for a nostalgic binge! @AhabSpampurse I really hope they look at porting that game over. The platforming controls were never really an issue imo, as it only took a few seconds to get used to them (and, the most important thing, the were consistent and responsive), but the swimming was hard as nails at times because of the buoyancy that meant you constantly had to keep making small adjustments so you wouldn't float into an enemy by accident. Also, those Death dudes and the [at the time] randomness of the Rock, Paper, Scissors battles were a bit unfair. Beyond that it was rather stellar. This looks like a great port, but I'm hoping there's an option to turn off all the stuff around the screen and just have black, and also to chop off the little coloured border you get at the edge of the game screen sometimes. It's a game I've had for a long time in the internal memory of a Master System my best friend gave me a few years ago, the same Master System I used to play with in his house along with him when we were kids, but never got seriously into trying to beat it. I guess I'll pick it up, but the review hasn't cleared one doubt I have: do the "tweaks" come in a pack with the easy version? Because I'd like to play without the extra help but also with the FM sound enabled. Is that combination possible? When I saw the hand icons I immediately guessed that it was the solutions, but I'd prefer not to see them, instead I'd put another border. Is that possible? Or it has to be that or no borders at all? Think an 8 is very generous for this. @AhabSpampurse Sure was an amazing game. @Mr_Pepperami Nah this game is a classic and the SEGA AGES version only makes it better. Truly definitive! Really loving the effort put into all the Sega Ages releases. They're superb and I'll definitely be picking this one up as well. Can't wait for Virtua Racing though! 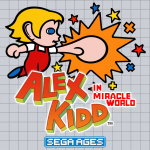 I think sega could make a new Alex kidd game if they want. Even a 3d one. Wow, the reviewer mentioned so many features that this game had back in the day that I have never heard of! This game was clearly ahead of its time, even if it was a tad on the frustrating side. M2 has really helped us out on that one with this Sega Ages release! Will probably purchase this just so I can finally complete it. Although even with unlimited continues and the Janken solutions that’s probably not a given. @impurekind The AGES games have an option to turn off the border or you can select from various colour options, but they are pretty ugly looking. Outrun has some extra arcade cabinet borders to choose from that are pretty cool. @RetroTyGuy I grew up with this game and just cuz it’s well known and a classic doesn’t make it an 8. The orginal super Mario bros must be a straight 10 or 11 out of 10 then based on this as it was wayyyyyy better than this game. @Moroboshi876 With Phantasy Star the FM music option was selected on the main menu screen, you could play AGES or Original mode with it on or off. I imagine it will be the same with Alex Kidd. The border options will likely just be the same as the others, AGES border/ No border or one of the various ugly colour options. I was about to say Outrun is the only release so far with extra border options but then I remembered Lightnening Force has an option to select the Thunderforce border. I'm not sure if the correctly titled European version has that option? @OorWullie I don't know either, I have the American version because I buy Sega Ages games in the Mexican eShop, the cheapest for these releases. I still have the OG cart for this! Definitely going to pick this up, as an owner of the Master System 2 with this built in, it is great nostalgia and not a bad game. I've missed this game, my first two video games were this and Wonder Boy 3: Dragon's Trap. Now they're both on the Switch! Sun, Water, Moon, Star, Sun, Moon, Water, Fish, Star, Fish, Crown. You may need to remember this! @OorWullie does Gain Ground have a tait mode- asking for a friend. @AhabSpampurse (un)funny story... I was looking through my Master System cartridges last weekend and Alex Kidd in Shinobi World was missing. Searched my house and can't find it anywhere. No idea what has happened to it or when. I agree that it's a classic game and not a good one to lose! This was the first game I ever owned and the only one I had for quite a few months. It was built in to my Master System 2. I loved it and at the time. I’ll be picking this up soon. @OorWullie Yeah, I think all retro games running on modern TVs need to have these kinds of options. Some people like graphic borders, and some people just like a simple black border so nothing is detracting from the game visually. Great review! Loved this game growing up. I’m also hoping for some clarification on how the different versions and options combine. To add to the question by @Moroboshi876 - can you pick original and Ages version of all three releases (Japanese, Western re-release and hamburger version)? And are the buttons mapped the same for all versions? Very thorough review! I only recently discovered Alex Kidd when I got into researching and collecting for the Master System (the Genesis / Mega Drive is my usual go-to retro system) and it's wonderful to see such an iconic SMS game get the Sega Ages treatment. I'll be picking it up for sure! Actually, I'm going to stop typing this post and go buy it right... about... now. This game came out 500,000 years ago and I love it. Now where is the 3D remake ? This was my favourite game as a kid. The Master System II was my second console after my Atari 5600 and having this game built in turned me into a Sega fanboy who didn’t touch Nintendo stuff until years later. I could never get past the part where one of the henchmen returns for a second time and his head starts flying around after you win the janken match! Looking forward to finally finishing this with a little help from that rewind function, haha. @Mr_Pepperami I disagree. 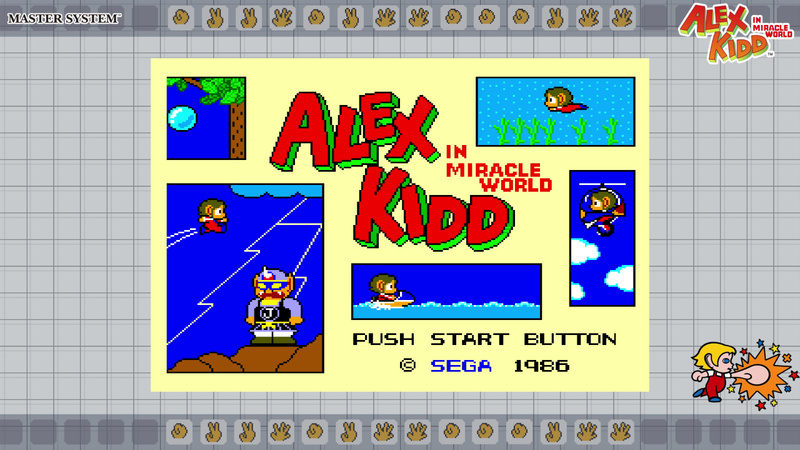 Alex Kidd in Miracle World was an extremely ambitious game and did things Super Mario Bros (the first one) didn't. 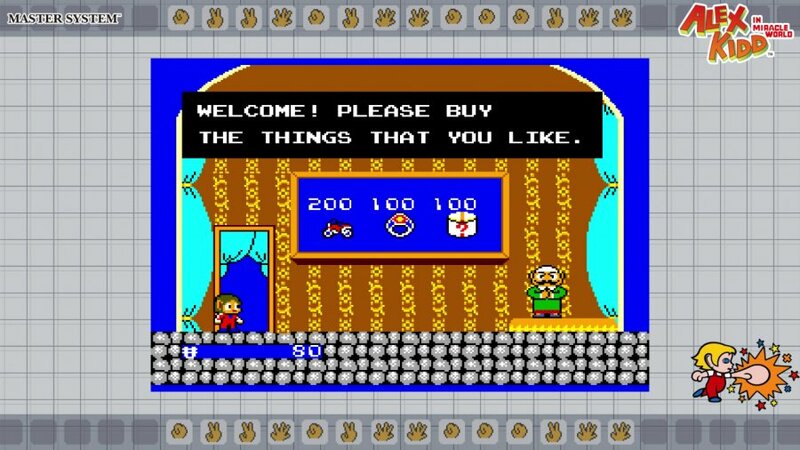 The overworld map, the RPG elements (item shops, magic) and the story itself... Alex Kidd is a more fleshed out adventure. 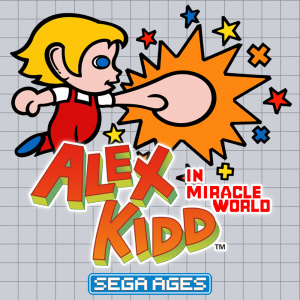 Gameplay-wise, SMB is faster, has better controls, and may have better characters, but Alex Kidd in Miracle World is at the very least an 8 out of 10 game. Alex Kidd never got the love he (sometimes) deserved back in the day. If Mario wasn't trouncing all over him on the Nintendo side, the abysmally-named, yet mostly amazing Wonder Boy series was stealing his thunder on the Sega side. This was an immediate purchase for me. 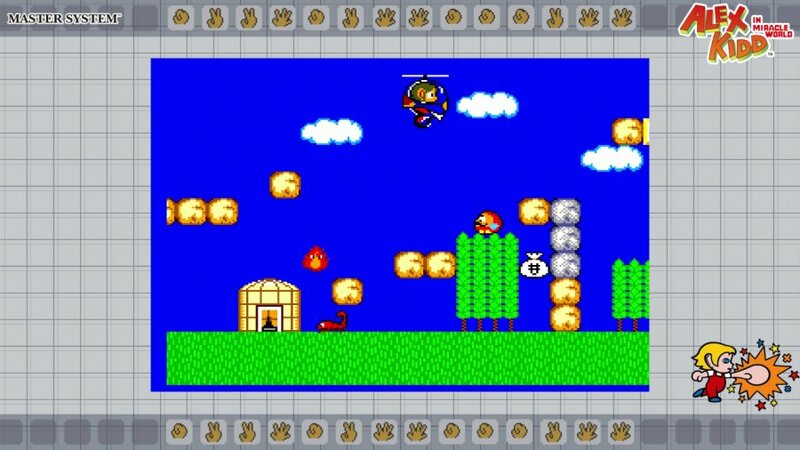 Sega did a lot of things wrong in the Master System years but Alex Kidd was definitely not one of them. Yay! I'm so glad it came out well. I suspect the fondness a lot of people hold for this game was that they played the crap out of it because it was included free in the Master System II - before they'd built up a game collection via birthdays and Christmas they didn't have much else to play. This was definitely my experience! I fired it up the other day and was staggered at how poorly it holds up now, in comparison to something like SMB3 which still plays brilliantly. It's the exact same game. The thing with both Wonder Boy and Alex Kidd was that they got shoved in games they don't belonged in at the outset, kinda like Mario did in his humble beginnings. 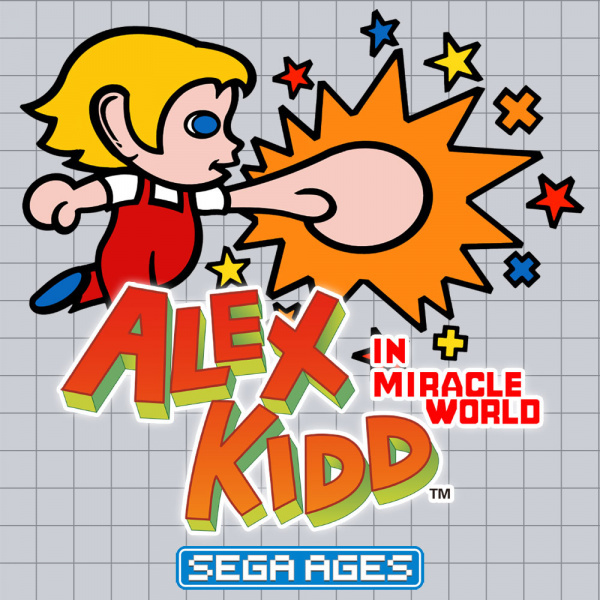 Alex Kidd in Miracle World only became an Alex Kidd game because it WASN'T allowed to be a Dragon Ball game. Several of his other games just needed a lead, and it's not like Alex was too busy. With Wonder Boy, basically anything Sakamoto or Nishizawa dreamt up got labeled "Wonder Boy" to sell it. While this has added to both series having severe identity issues now, as well as both taking a backseat for good when Sega decided on spending millions and millions on Sonic becoming a proper Pepsi to Mario's Coca-Cola, it also mean they both have rich diversity and tons to discover for curious player. It was a magical time for making and marketing video games. And now, I shall go cry in the corner for losing my Alex Kidd in Shinobi World cartridge. The improvements they made are nice, but even then how does a game with clunky controls and sadistic level design get an 8/10? This review reads like a 6/10 at best. I'll pass. @RetroTyGuy More ambitious doesn't necessarily mean better. When the gameplay and level design don't hold up, little things like overworld maps and shops aren't going to make up for such mediocre quality where it really matters. @BulbasaurusRex Again I disagree. I feel like it holds up. I forgot to mention the vehicle stages in Alex. Just more fun to be had in my opinion.